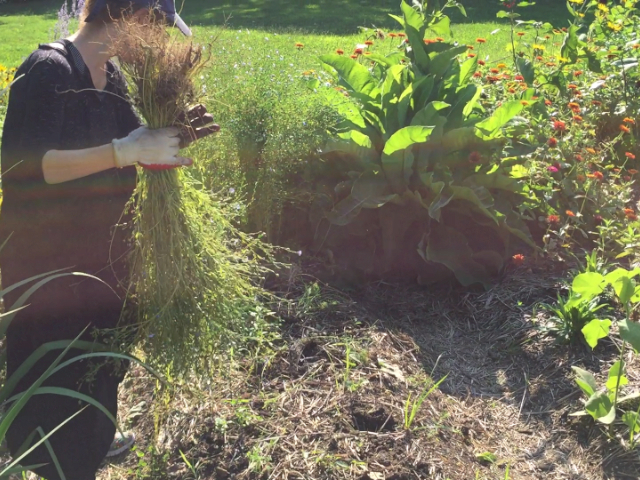 Pulling Flax at the Wyckoff House Museum, NYC’s oldest house. Summer 2017. Textile crop production in East Flatbush, Brooklyn, NY, my childhood neighborhood. I exploit the (assumed) delicacy and domesticity of beading, embroidery and crochet to emphasize resilience, flexibility and adaptability. Textiles signify/serve as body and voice, filling in for bodies and voices absent from historical accounts; quietened/silenced in our daily lives; held aloft yet silent as secrets in families. Gaps in narratives beg to surface and bloom; I research and share calculated ommissions through repetition of visual motifs. My processes and resulting artworks question the complex social systems we clothe ourselves in, the degrees to which we are (un)aware of the boundaries between social expectations, personal identity and behavior.